PUTRAJAYA, 1 Dec 2013 – A team of researchers from The National University of Malaysia (UKM) have discovered a new species of Pakma flower or Rafflesia in the Mount Benom Forest Reserve in Raub, Pahang, which it named after the university’s Vice-Chancellor. The research team, lead by Prof. Dr. Jumaat Adam, had done a study on the parasitic flower for the past two years. So far it is only found in the tropical rainforests of Peninsular Malaysia. 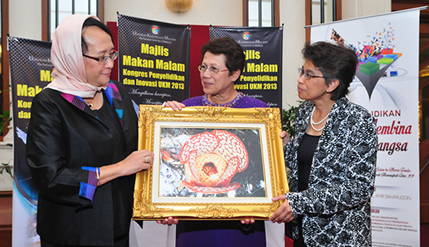 “The Rafflesia flower is named Rafflesia sharifah-hapsahiae after UKM vice-chancellor Prof. Tan Sri Dato’ Sri Dr. Sharifah Hapsah Syed Hasan Shahabudin who often provided support and encouragement in carrying out the research,” he told reporters at the UKM Research and Innovation Congress dinner here,today. However, it was only confirmed as a valid discovery in September 2013 and published in a Turkish Journal of Botany. Prof. Dr. Jumaat from the School of Environmental and Natural Resource Sciences, UKM, said the difference between the new flower and the other Rafflesia is the pattern on the petals and flower window are much closer and the nodules on the diaphragm is more clearly visible compared with similar flowers, Rafflesia azlanii. The flowers are brightly coloured ranging from orange, reddish brown and maroon mimicking the colour of meat and emitting faint to strong odour depending on the species, which attract pollinating agents like flies. Prof. Dr. Jumaat, Head of UKM’s Fraser’s Hill Research Centre, has done research on the Rafflesia flower since 1982 at Tambunan. After that, he was concentrated to the research of pitcher plant (Nepenthes) and then resume their research about the Rafflesia at 2008 until now. He also was a member of the secretariat of the establishment of the Rafflesia Information Centre, Sabah. He said this was the fifth Rafflesia flower recorded in Peninsular Malaysia, ninth in Malaysia and the 32nd in the world. The genus Rafflesia is a holoparasitic flowering plant of the tropical rainforests of South-east Asia. It is exclusively dependent on the host vine plant for its protection, nutrition, and survival. The host is specific namely Tetrastigma rafflesiae. The vegetative parts of Rafflesia are reduced to thread-like structures, and huge flowers are produced externally on the root and stem surfaces of the host plant, with a diameter of up to 150 cm in Rafflesia arnoldii. The biggest flower ever recorded for Peninsular Malaysia was 105 cm in Rafflesia kerrii. Not all flowers of Rafflesia are gigantic in size, and 5 of the known Rafflesia species measure between 15 and 20 cm in diameter. Rafflesia has many vernacular names ; including bunga pakma, bunga pecah belah, bunga kobis, bunga akar, kerubut, kekuanga, yak-yak, wusak, tumbuakar, bunga matahari, devil’s betel box, cendawan matahari, sun mushroom, dai huang hua, monarch flower, sun toadstool and stinking corpse.